Are the animals we eat really treated as well as the industry portrays? How would their promotional videos stack up to undercover footage in their facility? Find out in the video above. Take 3 minutes to go behind the scenes at Smithfield Foods, the largest pork producer in the world. If Smithfield lied, can any “humane” claims be trusted? Watch the video above to see the comparison of Smithfield's public image and private reality. The undercover investigation focused on Smithfield's used of gestation crates, which is by no means their only questionable practice. The details below are not included in the video and will be explored further in future works. The largest producer of pork in the world, Smithfield's flagship slaughterhouse, as it were, “processes” 32,000 pigs a day leading to worker injuries alongside the intended death of millions of pigs a year at that one plant. Their operations are worldwide and growing. Smithfield is also responsible decimating the environment with lagoons of feces and urine the size of four football fields and the industry standard practice of shooting the rancid mixture into the air, where it is carried into neighborhoods, causing asthma and respiratory issues for the low-income residents unfortunate enough to live nearby. In 1997 Smithfield was issued the largest clean water act fine ever at that time of $12.6 million. Smithfield has also, like the majority of industry slaughterhouses, perpetrated repeated human rights violations. However, their use of gestation crates was the main focus of public outcry after the HSUS investigation was aired, leading to McDonald's putting pressure on its suppliers to phase out their use. A gestation crate, also known as a sow stall, is a small cage of sorts where pregnant mother pigs are kept (or crammed) for most of their lives. 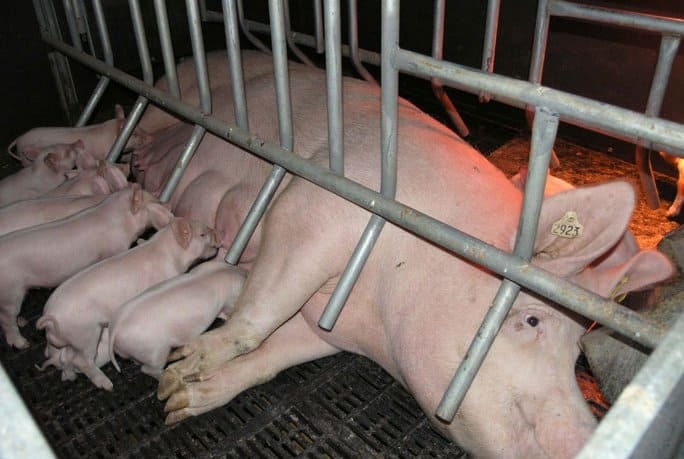 When they give birth they are moved to farrowing crates, which are no better. Gestation crates at the Murphy-Brown/Smithfield facility in the above video. Example of a farrowing crate. Here is the background for Smithfield's back-and-forth with their commitment to phase out gestation crates. I would like to emphasize that while gestation and farrowing crates are particularly sadistic, their removal does not make the treatment of pigs in the industry acceptable nor humane. There is no humane way to keep another being captive as property to be killed at our whim. Because Smithfield owns their entire hog farming operations, from breeding, to raising, to transporting, to killing, they alone control every moment of these pig's lives. ➤In 2007 Smithfield committed to phasing out the use of gestation crates by 2017  but went back on their word in 2009 . ➤In 2010 the Human Society of the United States (HSUS) released a damning video of undercover footage from a Smithfield facility. You can see clips from this in the video above. ➤Two months after the investigation was aired, Smithfield created the promotional video used this in his comparison. ➤This promotional “commercial” is at a Murphy Brown facility, on of Smithfield's subsidiaries that it has sense completely absorbed. ➤That year, following the investigation, Smithfield recommitted to its goal of phasing out gestation crates by 2017. 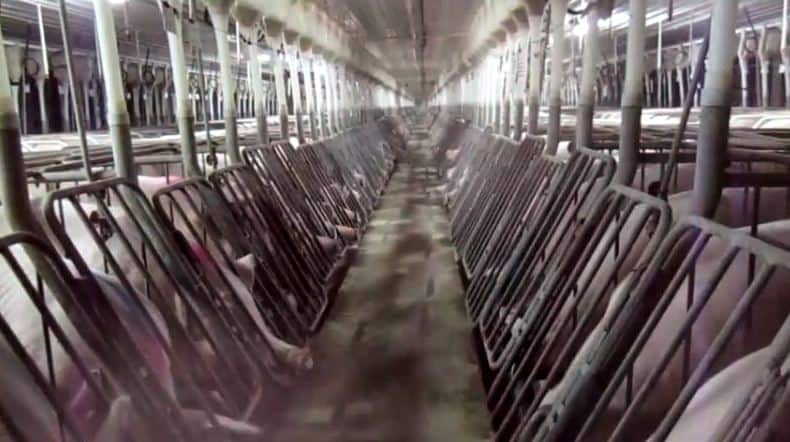 ➤In 2013, Smithfield announced that 38% of its sows were now in “group housing,” however, what was not evident is the fact that the majority of Smithfield's pigs are raised and house by producers under contract, meaning their “reform” will only reach something like 20% of their pigs. This abuse is by no means isolated to Smithfield. This is a global issue. Smithfield, among with major slaughterhouses around hte world, use the industry's “highest standard” of “humane pig slaughter. You can see just how humane in the video below. If you'd like to support Bite Size Vegan's activism, please see the support page or join us in the Nugget Army on Patreon. And subscribe for more content every Monday, Wednesday, and some Fridays. Now go live vegan, learn the truth, and I'll see you soon. I couldn’t watch, it breaks my heart. I am so sorry for not watching. But if anyone honestly believes animals raised and slaughtered for food are treated humanely that are delusionary. They are not treated humanely and everyone knows that but chooses to ignore because they like eating dead and decaying animal flesh. I used to work at QuikTrip, and most of our animal products were labeled from Jones Dairy Farm. Perhaps you could do a video on them. Recently, I was talking to a fellow vegan, and he said he watches abysmal / horrific video about factory farms or animal treatment, just to stay “active” / have it “fresh” in his mind. I watched Earthlings over a year ago, and went vegan overnight. I thought I didn’t need to see any more of that, since I was already convinced. Watching your video was good, though, because now it’s fresh in my mind, and I have renewed vigor about veganism.